Back in a more innocent age, when milk was delivered to your door and you could return your Lucozade bottle for a deposit, bidons were for for life. No lobbing into the hedgerows back then, no kitchen cupboards creaking with bidons commemorating every cycle-related event you've been to over the past decade. Back in the good old days, bidons were made of metal and they went on forever. During the 1940s and 50s, one metal bidon stood out on successive grand tours. Coloral had the market sewn up with its fluted design and cork stopper with the distinctive scripted logo on the top. These metal bottles carried water or sugary milk (the energy drink of the day), and sometimes, when victory was in sight, wine. Coloral's success was not enough to prevent the march of progress and as plastics began to take over the world, the bidon entered an era of disposability. Coloral ceased production in 1954. It was always going to be cheaper and more convenient to produce bidons from plastic, but that hasn't stopped one group of retro cycle-loving friends from embarking on a "labour of love" to revive the original Coloral bottle, 71 years after the original was first made in Britain in 1947. "We delved into the British Library's archives to learn the history of Coloral, visited vintage bike festivals, steel spinning factories and observed the traditional methods used in the production line," explains co-founder Tom Cartmale. In the brand's heyday, Coloral bottles were in the cages of most sports cyclists. They cost four shillings and sixpence and were made in Birmingham. The modern version of the Coloral 1947 Classic Bottle features a number of improvements on those early models, reflecting advancements in manufacturing techniques. Gone, for instance, is the aluminium construction. You now get food-grade stainless steel, with double wall vacuum insulation to accommodate both hot and cold drinks (and keep them that way). The dimensions have also been tweaked, to allow for transport in both a bottle cage and a cup holder. You still get the distinctive fluted body and the ridged cap design, although the cork stop is now a base plate. 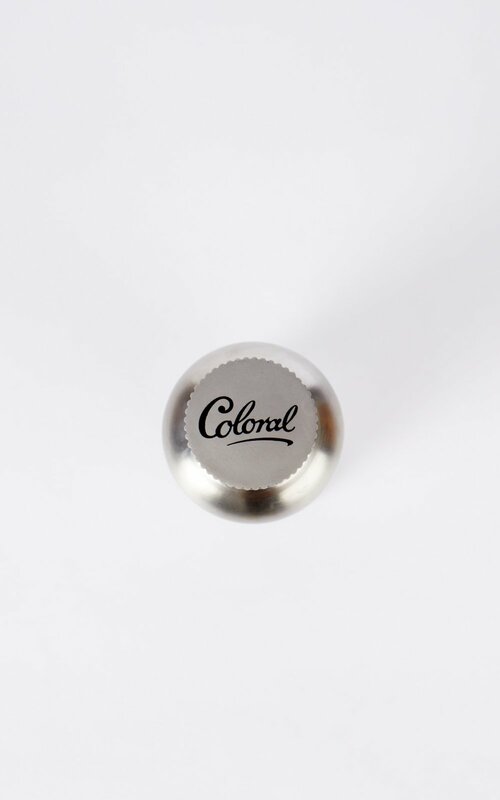 Perhaps the most remarkable aspect of the Coloral 1947 Classic Bottle is the total absence of plastics. All have been eliminated in manufacture and packaging, reflecting the company's strident eco-credentials. Coloral has even pledged to donate 10 per cent of the £35 sale price of each bottle to Re-Cycle, a bike charity that repurposes 165 tonnes of discarded bikes every year and teaches African communities how to repair and maintain bikes, enabling them better access to drinking water, healthcare and education.